Whether for freeze protection, energy conservation, or personnel safety, insulating blankets and jackets can provide adequate levels of insulating performance in a removable form. Unitherm International fabricates an extensive array of standard shapes to accommodate almost every conceivable fitting, valve, strainer, or other device found in a piping system. Custom fabrications are available, as well. 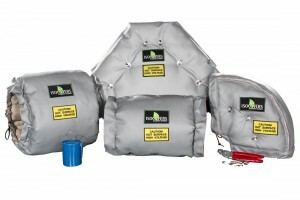 The insulation jackets are universal and modular in their application, simple to install, rugged and long lasting, delivering energy conservation values far in excess of their cost. Removal and reinstallation of the insulation assembly is easily accomplished when access to the protected fitting or device is required. A similar assembly is also available as a heated jacket or blanket that delivers even and controlled heat to maintain minimum temperatures in the covered or enclosed item. There are almost uncountable applications for the standard and custom shapes available. There is more to learn about how insulating jackets and blankets can be applied to improve energy performance and protect assets and personnel. Share your challenges with a product application expert, combining your process and facilities knowledge with their application expertise to develop effective solutions.